- The Border with Haiti - Early in the twentieth century, the US military built a stone road between Haiti and the Dominican Republic in an attempt to better define the border. No maps I’ve ever seen show the entire route. I read that most of this road or trail is unpaved and rarely used, covered with jagged tire gouging rocks, pockets of mud, and areas washed away from heavy rains. Also, it’s rumored that areas along the border are haunted by the wailing ghosts of dead Haitians who had fled there during the colonial era in order to escape slavery. This all sounds good to me. I have been living on this island with my wife for the past 5 months exploring the country by motorcycle. 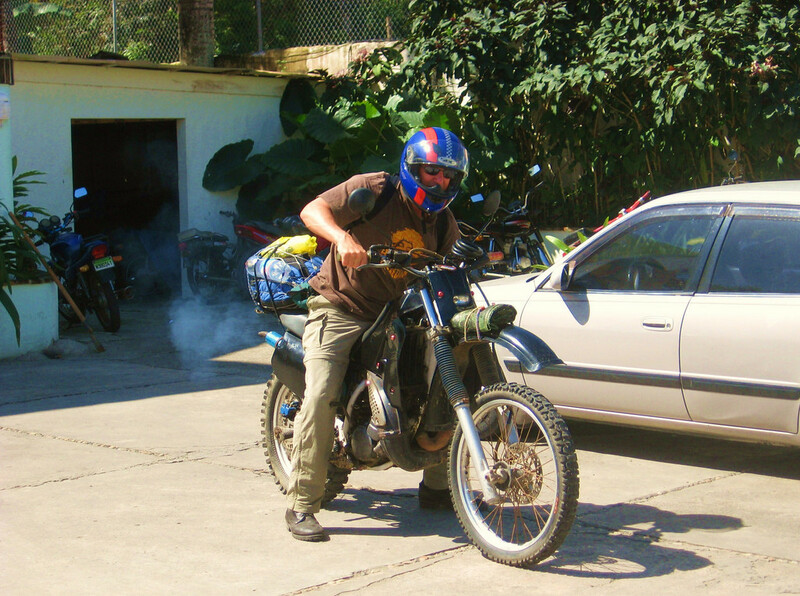 Before my old and abused motorcycle completely falls apart, I need to attempt the Haiti border run. The time is now. I have no excuses. Motorcycle adventuring is serious business, for the Haiti border run I need to be very serious. Heidi is my solid partner in every adventure I do, solo or 2-up with her. 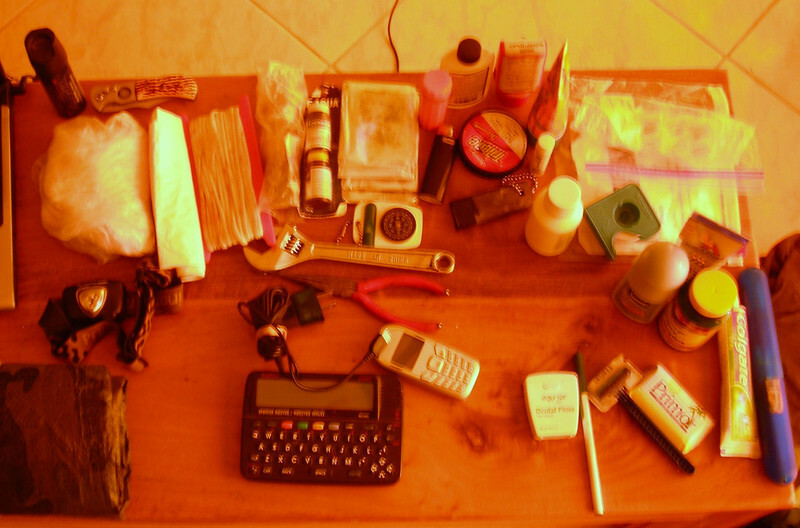 While getting ready we talk about my gear, its a mental shakeout; camping gear, survival gear, safety gear, first aid supplies, motorcycle tools, world-phone. Check. The motorcycle is a 1984 Yamaha DT-125, a one cylinder, two-cycle enduro, striped down and painted black. This is a small but serious off-road bike, it has disk breaks and is water cooled. My only concern is the rough shape the bike was in when I picked it up five months ago and all the hard riding we have done on it. Wrenching on motorcycles has always been a joy of mine, but lately I have had too much joy.––broken shift lever, break linkage, radiator twice, headlight, flat tires, and a blown head gasket. I hope the problems are done. 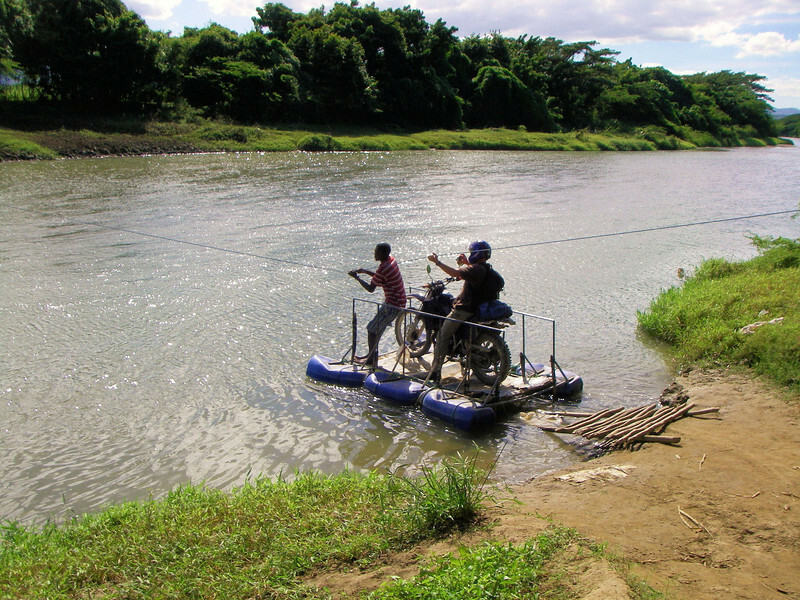 This ride starts at a village called Cabarete Beach, once a small fishing village on the north coast of the island. Heidi and I lived here back in the 90’s and it’s a great base camp for exploring the island. Only six miles into the ride and my new shift lever is loose again. Luckily there are motorcycles repair shops everywhere in the Dominican Republic. Out of 2.1 million registered vehicles, over 1.3 million are motorcycles. With all these motorcycles there appears to be a strong brotherhood among the bikers. As a solo foreigner motorcycle traveler, I am 'one' with this brotherhood. Riders look out for fellow riders here making it an enjoyable place for motorcycle adventure travel. I never feel alone, and that’s a good thing especially in the more remote areas. 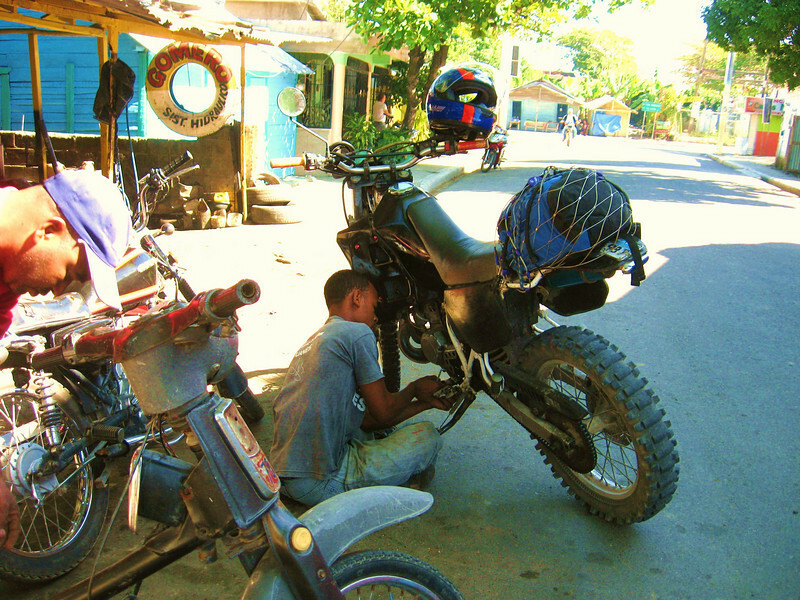 Dominican Republic motorcycle repairs happen out on the streets, the sidewalk or anywhere where there is a spot to do it, tire change to new piston rings. And best of all, 'while you wait' service. I have been to a lot of shops here and all but once I received immediate service, absolutely incredible. My bill this time is only 50 pesos, a dollar forty US. With a 50 pesos tip, everyone is happy. The shift lever seems good, all right! My goal today is the extreme northwest corner of the country, the village Monte Cristi. 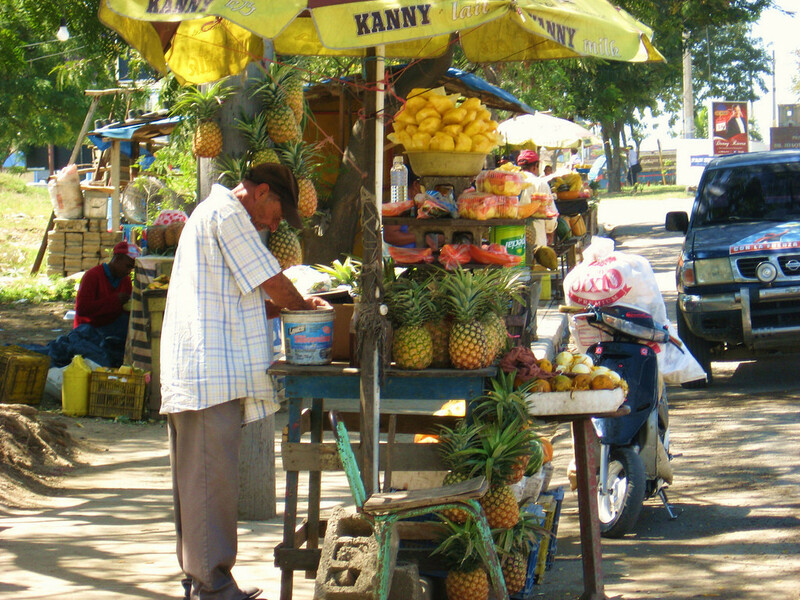 This is great off the beaten path route through real Dominican Republic. However, the route is not new to me, so today riding hard and fast feels good. Monte Cristi is the end of the Dominican Republic and the start of Haiti on the Atlantic side, the start of the border run. Monte Cristi was once an important trading port used for shipping sugar and valuable lumber. Today the village is dusty and feels a little run down. The town supports farming, fishing and salt mining today. South along the border are scattered farms on flat arid land. The gravel road is rough and passes through small border villages. 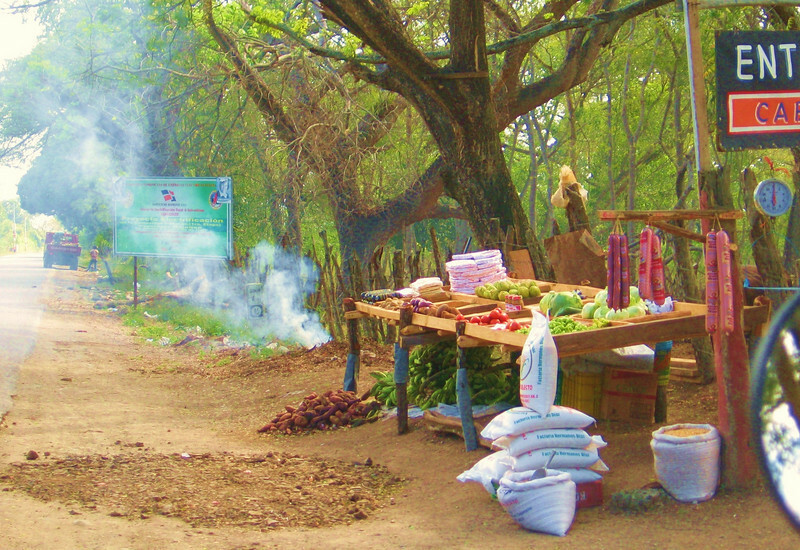 Soon the gravel road improves and runs into a greener region with roadside stands selling fruit. 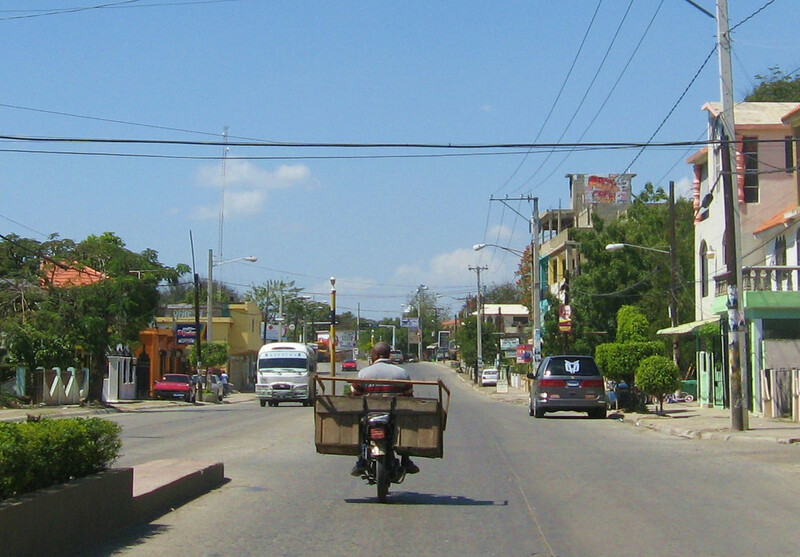 A motorcycle is parked along the side of the road with a rider working on it. I ask if he would like to use my tools (?querers herramientas?) With my wrench he takes off his chain guard and throws it off into the weeds saying “!no neccesato!” (I don’t need it!) What a great feeling helping out a fellow rider, and around here, it is simply part of the culture. People help each other. 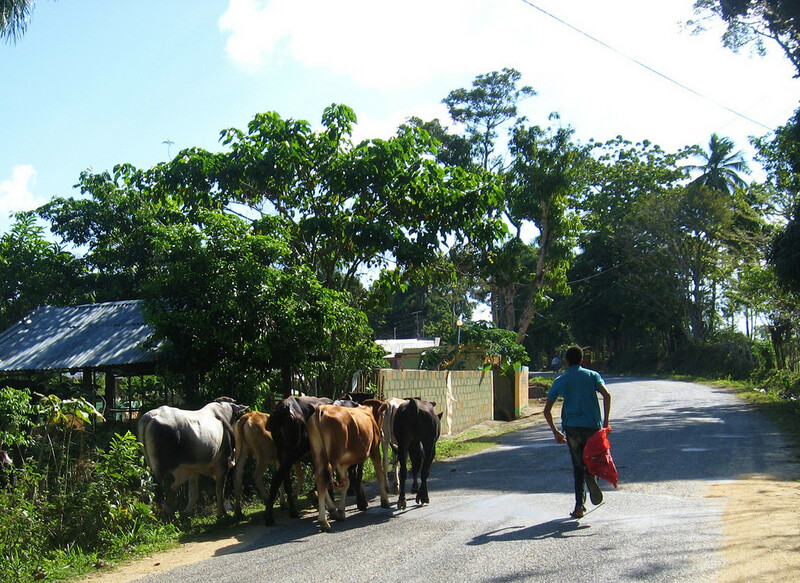 In the Dominican Republic, if you ride off the main freeway at all, you can expect to see cows or horses at any time. Only a half an hour down the border road and my shift lever is loose again and I am having a hard time shifting. In the next village at a motorcycle shop, I explain my concern. The mechanic is on it in seconds and confidently starts hacking on the shift lever with a hacksaw. He is trying to widen the gap where it clamps, making the lever clamp better, or at least that’s what I think he is doing. 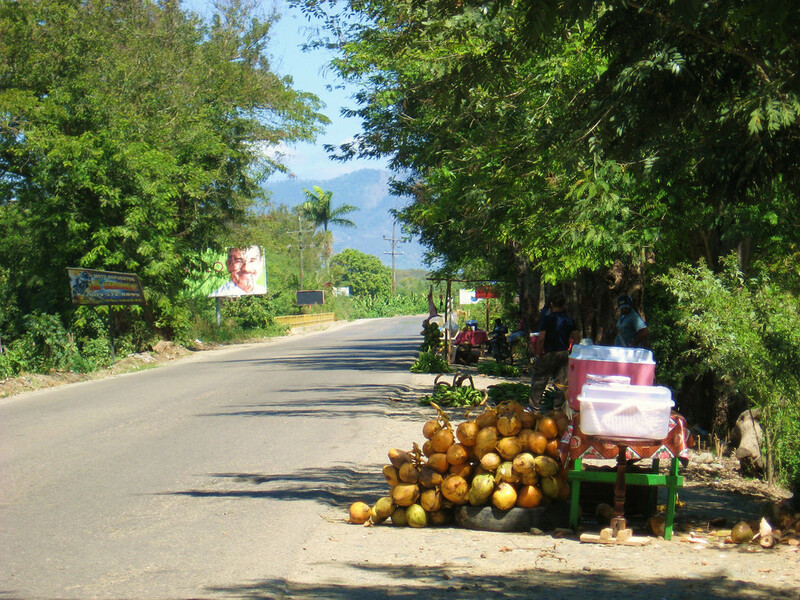 Riding further the traffic increases with trucks loaded down with huge sacks of potatoes and there are coconuts sold roadside. I am always amized as to how fast the scenary changes here, you never have a chgance to get boared. In a small village a women is frying empanadas on an open fires on the outside of a small store. An empanada is a meat, cheese or egg filled pastry found everywhere in the rural countryside and can be bought for between 30 and 60 cents. There’s a group of men playing dominoes in the shade behind the store. The atmosphere is like some of the small farming communities in Northern Wisconsin I ride through, a familiar feeling. 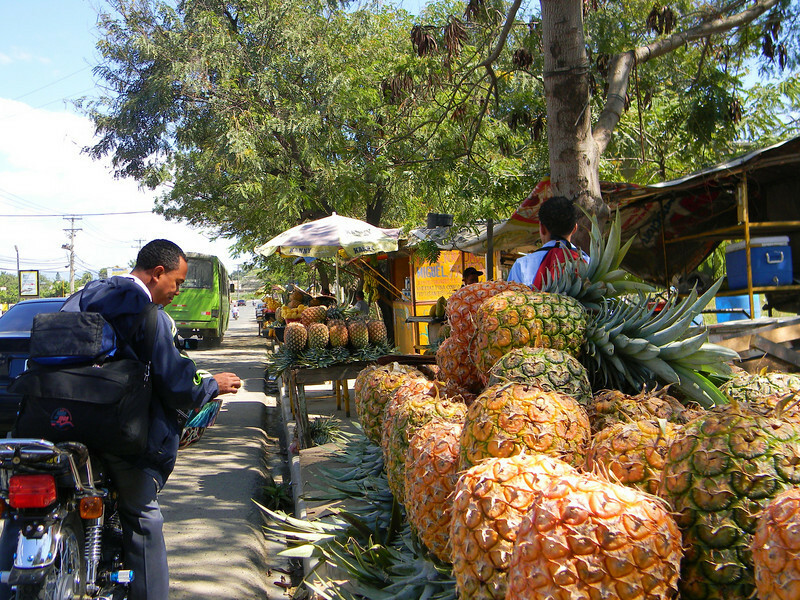 Pineapple quartered and bagged for 20 pesos. A train passes. I did not think there were any still in operation. 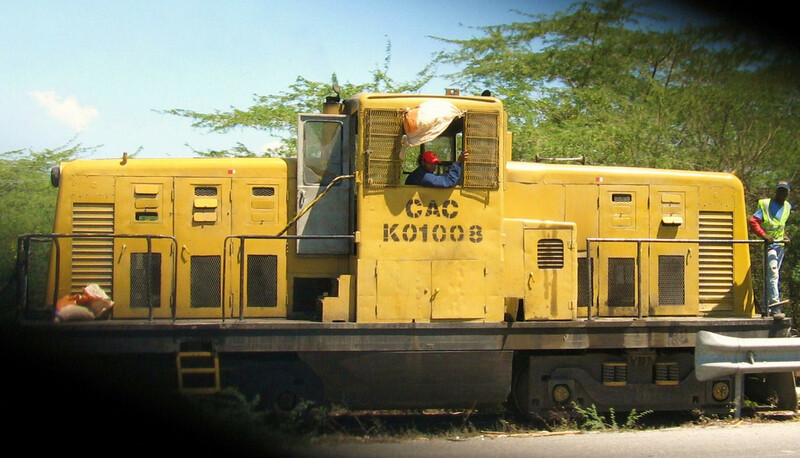 This train is carrying sugarcane looking like long sticks.